From a Halachic standpoint, Sefer Torah MST#1272 is pasul (פסול), Hebrew for invalid. The damage to the scroll is such that it cannot be used for reading at services. Yet its significance to the congregation at Temple Beth El is no less meaningful or sacred than any other Torah that we have. When the Munich Agreement was signed on September 29, 1938, Britain and France agreed to Hitler’s demand to be given the German-speaking border regions of Czechoslovakia, and the Germans marched in. The Jews in the towns had two or three days to flee to the interior, which was still a free and sovereign country. During a vicious pogrom In November 1938, synagogues across the expanded Germany were burned or vandalized and looted. In almost every case the ritual treasures of these Sudetenland synagogues were destroyed or lost. In the remainder of Czechoslovakia, which included Prague, the synagogues and their swollen congregations were safe for the time being, and there was no program of destruction, even when the Germans invaded the rest of the country in March 1939. In 1940, congregations were closed down and the first deportations began in 1941. In 1942, a group of Prague’s Jewish community devised a way to bring the religious treasures from the deserted communities and destroyed synagogues to the relative safety of Prague. The Nazis accepted the plan and more than 100,000 artefacts were brought to the city’s Jewish Museum — gold and silver and ritual textiles, books, Torah scrolls, even clocks and pianos. 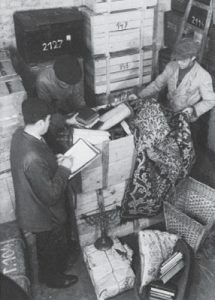 A large number of Jews were put to work by the Germans to sort, catalog and put into storage all the items that had come from over one hundred congregations. It needed over forty warehouses to store all these treasures. When the task was eventually completed, the Jews who did this work were themselves deported to the Terezin concentration camp and death. There were few survivors. It was once accepted that the accumulation of this vast hoard of Judaica was intended by the Nazis to become their museum to the extinct Jewish race. There is, however, no evidence that any such museum was ever planned. After the war, there were no longer Jewish communities in Czechoslovakia able to restore, use or display the Torahs so they were placed under the control of the Czech government. 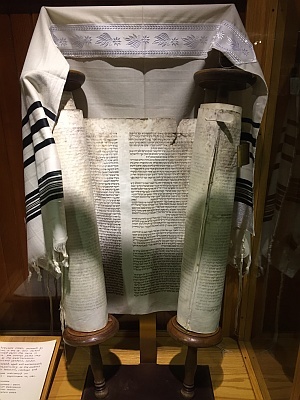 In 1963, the scrolls were acquired by Ralph Yablon a member of London’s Westminster Synagogue, which took responsibility for 1564 saved scrolls. A year later, they arrived at Knightsbridge, the home of the congregation, where they were restored for use or transferred to others for memorial displays. The Memorial Scrolls Trust, www.memorialscrollstrust.org was set up to care for and allocate the scrolls on long-term loan to synagogues and organizations around the world. Czech Memorial Scroll MST#1272 arrived at Temple Beth El on Rosh Hashanah 5743, September 18, 1982.